Marble countertops makes for an excellent design choice in both bathrooms and kitchens. These counters are gorgeous but unfortunately can be a bit high maintenance. Natural stone such as marble is especially sensitive to acidic cleaners and other materials with acidic ingredients. This can make caring for and preserving these stone counters difficult, especially in spaces with high humidity like in a bathroom. 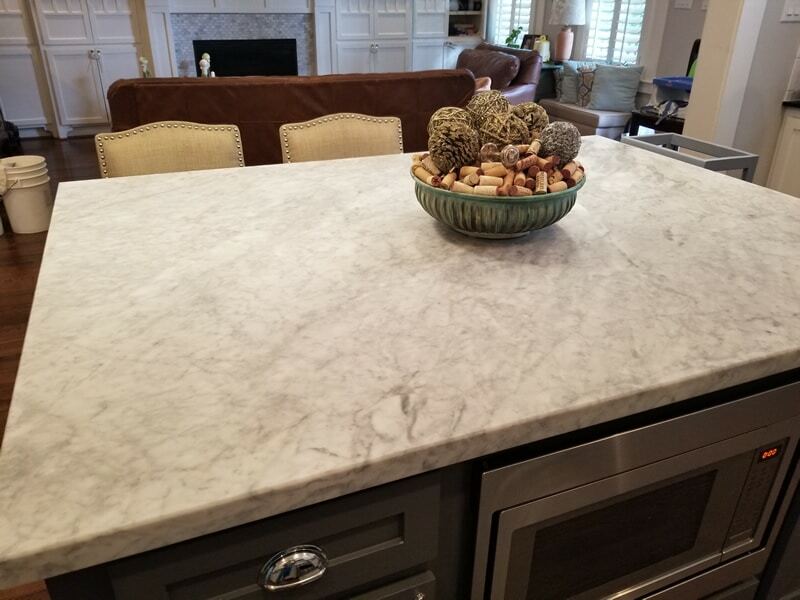 The best way to keep your marble counters in great condition for as long as possible is with regular routine marble countertop maintenance in Houston. At Modern Stone Care we help our clients lock in the beauty of their marble counters by deep cleaning the stone, polishing the stone, and most importantly sealing the stone. Sealing your marble counters is important because it provides a clear barrier between the stone and outside influences such as moisture. In a room such as a bathroom it may require more frequent sealing to protect your stone from the moisture than it would in another space. Modern Stone Care can assess your space and your stone surfaces to let you know how frequently your stone will need professional maintenance in order to stay looking great. In addition to our mentioned services, at Modern Stone Care we can hone your marble counters to make them have a matte finish like the counter in the photo above. This is a great option for someone who is wanting to mix up the look of their stone surfaces for a unique look. Don’t let your stone surfaces look dull this upcoming holiday season! Instead, contact Modern Stone Care to explore your options and learn about what we can do for you Marble, Slate, Granite, Travertine, and Limestone surfaces! Don’t forget to also ask about our tile and grout restoration services!